This entry was posted in Content, CrossFit, Fitness, Mobility, Programming, Training by Justin. Bookmark the permalink. Will I get jacked like Klokov? But in all seriousness, good article Justin. Gives me hope for my future self. How would you incorporate conditioning with a lets say a 4 day a week oly lifting program? The neat thing is I have a good hill not far from my house that is great for hill sprints. Good thinking here. 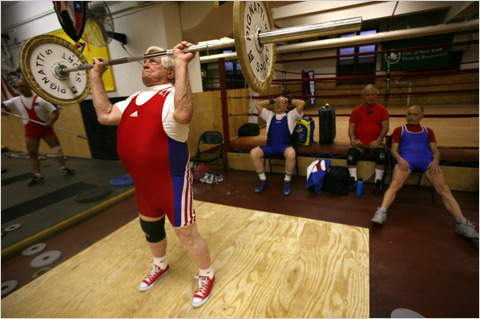 There was a 79yo lifter in the last meet I have been to. The only concern could be the blood pressure increase during the lift (even for a lightweight). Although the article is dated, I just found it searching for “training tips on Oly Lifting for seniors”, today. I just wanted to thank the author for a fresh, humorous take on the issue. I am now a registered user of the site, and look forward to similar fact based commentary with a ‘tongue-in-cheek’ style of delivery!